Slotland, one of the first online casinos to offer real money slot games, has just added another unique game to its collection. Just in time for St. Patrick’s Day, Leprechaun Luck has a bonus game that awards up to 500X multipliers. It's actually two games o' one! Try the new game this weekend and take advantage of generous deposit bonuses with varying wagering requirements now available. Leprechaun Luck was originally created for Slotland's other site, WinADay Casino. The enchanting game is a 5-reel, 31-payline slot with both Wild and Double Wild symbols. You choose how much to bet per line and how many lines to bet on. You can wager as little as a penny. However, if you're feeling the luck of the Irish, you can bet up to $124 per spin. During regular spins you'll collect special symbols. When you've got all four, a bonus game begins. Roll the dice to move a leprechaun up a shamrock stairway. Step on a green shamrock and you'll win up to 500X the triggering bet. If you spin three or more Cauldron scatter symbols, pick one of them to reveal an instant bonus prize. 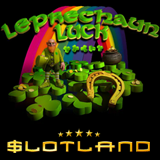 Leprechaun Luck is tied to Slotland’s site-wide progressive jackpot. Spin five Rainbow symbols with a minimum $5 bet and you'll win the jackpot. It's currently over $235,000 and well overdue for a win. “At this time of year it seems we’re all got a wee bit o’Irish in us!” laughed Slotland’s manager, Michael Hilary. 200% up to $600 introductory bonus and St Patrick's bonuses available until March 13th. 20X wagering requirement; valid for Leprechaun Luck only. Lower wagering requirements -- valid for all slots and progressive jackpot games. 16X wagering requirement; available to VIP players only. 12X wagering requirement; may be claimed once per day. 10X wagering requirement; may be claimed twice per day. These bonuses are valid March 8-13, 2017 only. Not available in mobile casino. Since it opened more than 18 years ago, Slotland has earned a reputation with players all over the world for friendly, reliable customer service, generous casino bonuses and unique games.